Photo courtesy of Yancey Family Genealogy. As we have mentioned before, African American genealogy often becomes more difficult for the researcher when using records before the 1870 federal census. The task of checking records and deeds of sale for persons whose last names may have changed several times prior to the Emancipation Proclamation in January 1863 and again upon the conclusion of the Civil War takes a great deal of time, even with the growing body of published sources available. Tax records are another source which may possibly lead to the identification of individuals. The following list shows the name, age and value of each slave owned by Christopher Melchor of Cabarrus County. It was taken from the 1863 Cabarrus County tax assessment list. The original record book, titled Record of the Assessment List and Other Proceedings Had Thereon by the Board of Assessors, is located in the Office of the Clerk of Court, Cabarrus County Courthouse. The microfilm record prepared by the N. C. Archives is labeled Cabarrus County Board of Assessors, Record of the Assessment List, 1860-1868, 1 volume. Copies of the original document are also on file in the Lore Local History Room at the Concord Library. 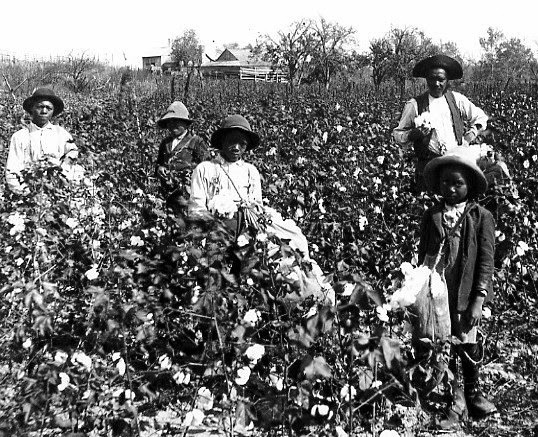 Most of us have an image of our early Cabarrus ancestors farming the land and growing their own food. After all, they did not saddle up the family horse and ride down to the corner store for a loaf of bread - at least, not as we drive to the supermarket today. The women in each household usually baked their own bread from the grains grown on their own farms. But rarely did each family grind its own grain into flour. For that, they relied on the nearby miller and his grist mill, one of the earliest industries in the county. and the North Carolina Digital Collection. Cabarrus County court records list at least thirty mills between 1795 and 1860. Most are grist mills using the water power of a nearby stream to grind corn or wheat into flour. In some cases, these mills also used water power to saw lumber, to gin cotton and grind and stamp gold. A few of the mills we know include George Masters' Mill, Buffalo Creek; Bost's Mill, Rocky River; Garmon's Mill, Coddle Creek; and Faggart's Mill, Cold Water Creek. There were even grist mills located in present-day Concord: Alexander McLarty's Mill was on Irish Buffalo Creek near Cabarrus Avenue and Isbon Cannon's Mill was also in town. Both mills sold or bartered extra flour, collected as grist mill fees, to townspeople who did not grow their own grains. Few mill sites still exist today, but their memories linger in the names of some of our coummunities like Mill Grove in western Cabarrus and Bost's Mill in southeastern Cabarrus. 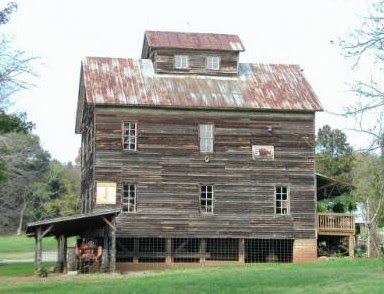 Additional information on Cabarrus County Mills may be found in the Minutes of the Cabarrus County Court of Pleas and Quarter Sessions; By the Old Mill Stream by the Harrisburg School Stephen Cabarrus History Club; and in the Local History Collection vertical files of the Concord Library. The following article was taken from Learn NC. Muriel L Wolff, Interview with Alice Caudle, Cabarrus, N.C., September 2, 1938. From the WPA Federal Writers' Project., Original source available from the Library of Congress. Like Alice, the young girls shown above worked spinning machines at textile mills. Wickes Hine, U.S. National Child Labor Committee, Courtesy of Learn NC. Alice Candle (sic), who spoke these words so gaily, did not look as if she had spent much time in rebelling against her fate. Her tanned face may have been somewhat wrinkled for her forty-seven years*, but they were pleasant wrinkles; her eyes were alive, her hair thick and brown, her teeth (they were her own) seemed good in spite of the dark rim of snuff around them, and her body was active looking. She sat perfectly relaxed, rocking gently back and forth and occasionally leaning over the front porch banisters to spit. The red voile dress she wore without a belt, for coolness, and she did not have on stockings; on her feet were faded blue felt bedroom slippers. When she was about ten years old, Alice’s father had moved his family of four children from the farm in Alamance County to Concord. 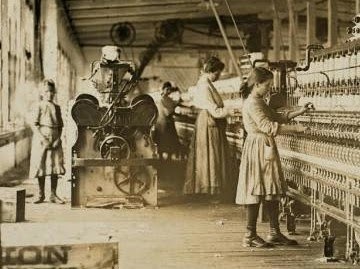 Alice didn’t go to school in Concord because she didn’t have to and “there weren’t no school buildings here the way there is now.” And so when she was ten, she began to work in the mill. Alice looked very much surprised when I said no, and proceeded to enlighten me. “When the day come for the supper Rose Panell come down here to go with me because they was sending a car for us two. Hit was held up in the Mary Ella Hall in Kannapolis. You went into a great big room, furnished jest as nice as you’d want, and they had a man there who didn’t do nothing but take your hat and coat when you come in and hang ‘em up fer you. I thought we would kill ourselves laughing and Rose kept a-wondering if we’d get the right coats and hats back. The other room where we was to eat looked as pretty as anything you ever saw. Such a sight of tables — and every one was covered all over and down at the sides with some of that white cloth that was finished down at the Bleachery; and there was flower pots set about on them. I didn’t think they’d have much to eat for such a crowd, but the tables was covered. They had turkey and everything; hit was real good. At present Alice works in the spinning room. There are only women in this division and she says they have a time together, talking, laughing and cutting up. “The section head don’t hardly ever come around. Sometimes I tell him that us old widow women back there could go off to South Carolina to get married and come back again, but he wouldn’t even know we’d been gone.” When asked why men didn’t work in the spinning room, she shrugged and made some remark about the patience and skill required for such work and added “you know how men are…” in a pitying tone. The morning shift, on which Alice works, goes from 7:00 to 3:30, with a half an hour off for lunch. For two full weeks work of five days a week she receives $31.00. When she lived over in another village (owned by the same company) her rent was $6.00 a month; now she lives with her daughter’s family and contributes to their expenses. *Blog Editor's Note: Records indicate that the interviewee was Jane Alice Mabrey Caudle, daughter of Philmore and Sarah Mabrey and widow of Oscar D. Caudle. Her birth year varies among sources, but the birth date on her death certificate is 9 Nov 1880. She died 26 Dec 1960 and is buried in Oakwood Cemetery, Concord. In this article we read the lament a father expresses to a nurse, Miss Sallie S. Beard, who tended his dying son, a Confederate soldier...It was sent by Dr. C. W. Andrews to Mr. W. H. Chesbrough Sr. in 1931. 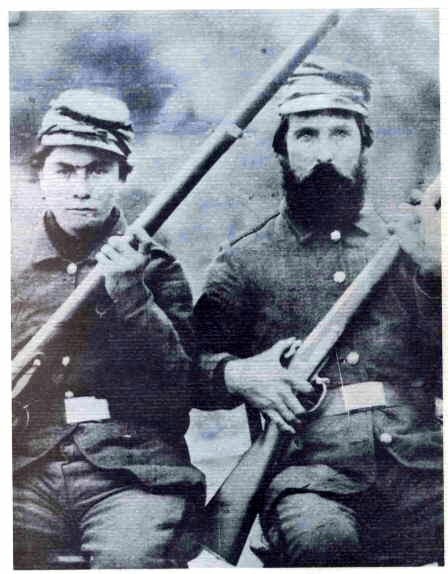 Mr. Chesbrough was a Civil War veteran and very active in the Grand Army of the Republic L. H. D. Crane post here in Beloit...The father of the Confederate soldier is N. Lefler and he is from Concord, North Carolina. The letter is dated June 8th, 1864. I seat myself this morning to address you a few lines in answer to your very kind and interesting by much lamented letter dated the 21st (ult) [last month] which I received on last night. Dear Madam I am under great obligations to you for the kind treatment you showed to my wounded son, and the great satisfaction I received through you giving me a statement of his wounds and the condition you found him in. Dear Madam I never shall be able to repay you for the great kindness you showed to him in his suffering condition the only compensation I can make to you at this time. I beg of you to accept my heart felt acknowledgement for you kind assistance towards him. I have not words to acknowledge the great indebtedness to you for the lock of my son's hair stained with his own blood, which I received in your letter through your kindness. Dear Madam the loss of my son was a heavy bereavement to me. He was the fourth and last son I had killed in this war in less than twelve months. Dear Madam I have one request to make you, will you be so kind as to state to me what effect he had with him when you first saw him and how he was clad if he had on a new uniform or if he had on any uniform, also please let any body else say that heard him speak, if so please give me their name. Dear Madam I could ask you a great many more questions but I fear I am trespassing on your patience. I will only say to you that he left behind him three motherless children, an old sorrowing mother and an only sister, to mourn his loss. Enclosed please find stamp to prepay letter sent back, this leave us all well hoping it will find you enjoying the same blessing. I will now close hoping to hear from you soon in return I remain your unknown but sincere and humble friend until death. Blog editors note: Upon further examination, it is believed that N. Lefler was Nicholas Lefler, a retired merchant and postmaster. The letter is in regard to his son Robert, who would have been about 29 in 1864. Robert's wife Clarissy (Clarissa) Ridenhour Lefler died in April of 1862. In 1870, Nicholas and his wife Betsy, both in their mid-60s, had custody of three children, James (age 13), John (age 11) and Robert (age 9). It is presumed these are the three children mentioned in the above letter. for military service by the British government. 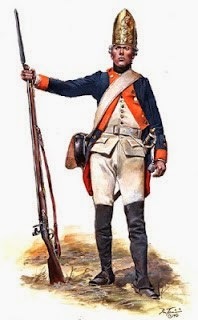 "Fusilier of Lossberg Regiment" by D. Troiani. Cabarrus County became a home to several Hessian deserters during and after the Revolutionary War. 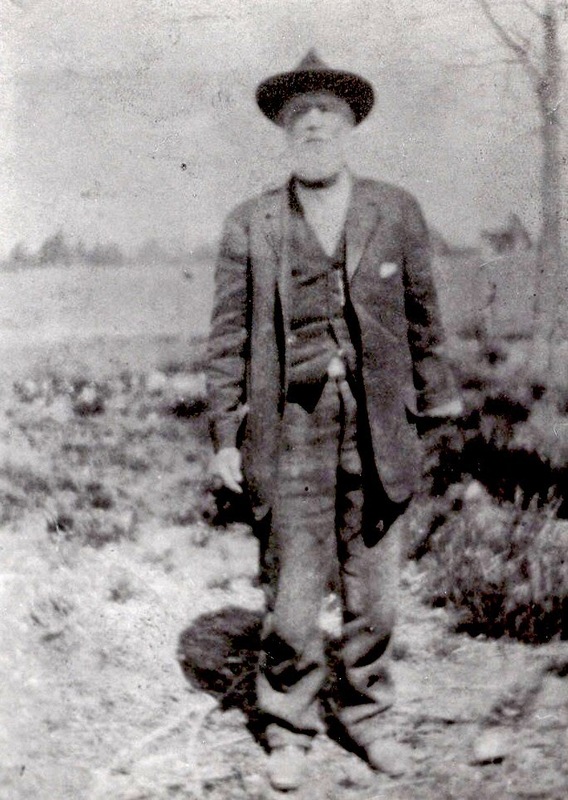 The list of early Cabarrus settlers believed to be Hessian includes Nicholas Isenhour, Henry Linker, William Heintzmann and Henry Kartesar. All of these men settled into the German community seemingly with ease. Many left descendants of the same name living in the county today. Henry Kartesar, however, apparently died without children. Born in Germany in January 1756, Kartesar died June 8, 1835 and is buried at St. John's Lutheran Church. He married twice - Caty Criss (probably Cress) in 1784 and Catharine Kiver (probably Keever) in 1811. In January 1795, Kartesar became guardian to two-year-old orphan Rachel Suther until she turned 18. Again, in April 1797, Kartesar became guardian to an orphan, 18-month-old John Nicholas Bonds, until he turned 21. Henry Kartesar reared both children as his own. In 1818, Kartesar sold his plantation and land to John Bonds in return for lifetime maintenance, and both Bonds and Rachel Suther Ritchie were heirs to Kartesar's estate. Henry Kartesar's Will, probated July 1835, left $1.00 to his wife Catharine (she survived Kartesar by less than four months) and divided the remainder of his estate equally between John and Rachel. He named John Bonds and Rachel's husband, Adam Richie, as executors. Information about Henry Kartesar, John N. Bonds and Rachel Suther Ritchie can be found in various Cabarrus County records, church records and research notes on Hessian deserters. 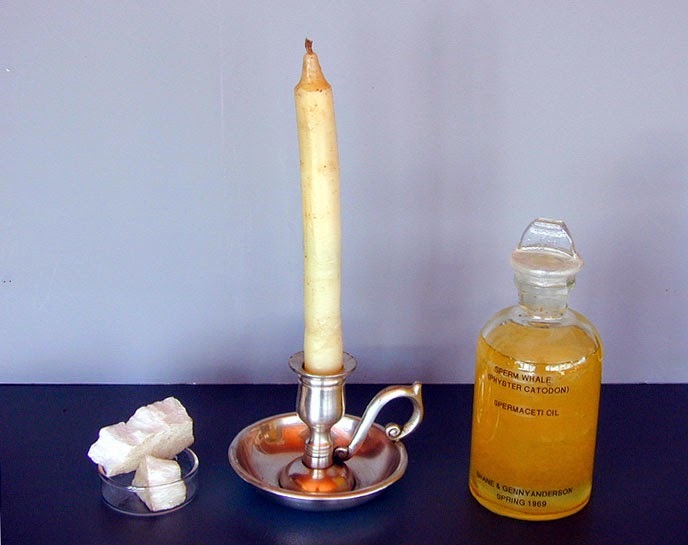 A sample of spermaceti wax, a spermaceti candle and bottle of sperm whale oil. The beauty and fitness craze is not new. Even in 1855, men and women concocted and purchased cosmetic preparations designed to make them look and feel more attractive. Charles J. T. Ridenhower of Stanly County, kept a notebook of his "most valuable recipes in use," including directions for cologne, cold cream and hair restorator. Certainly some of our Cabarrus County forebears made use of some of these beauty aids. These preparations are not recommended for modern consumers. Some ingredients, such as the spermaceti, a waxy substance which comes from sperm whale oil, are rare today. To make Cologne Water: Alcohol, one gallon; Oil of Lavender, 12 drachms (1 drachm or dram equals 0.0625 oz. ); Oil of Rosemary, 4 drachms; Oil of Bergamot (a pear shaped orange), 12 drachms; Oil of Lemon, 12 drachms; Cinnamon, 12 drops. Cold Cream: Take 1/2 oz. of white wax, 1/2 oz. of spermaceti and 3 oz. of almond oil; put the whole into a basin and place it in hot water till fused; then gradually add 3 oz. of rose water, elder water or orange flower water, stirring all the time with a fork or small whisk. Any perfume may be added; but medicinally, it is better without. Hair Restorator: 1 oz. oil of Bergamot, 1 oz. oil of Sassafras and 1 pint of Olive oil. Shake well together. Price $3.00 ($79.00 in 2014 dollars). The cosmetic recipes are taken from Mr. Ridenhower's book, a small volume in the Dr. L. R. Rose Collection donated by Edith Moose McAllister, is available at the Eastern Cabarrus Historical Museum in Mount Pleasant. Photocopies of this and other documents from Dr. Rose's papers are also available in the Lore Local History Room at the Concord Library. If you know of any locally used old recipes for beauty aids or health remedies, please e-mail them to cabarrusgenealogysociety@gmail.com for possible use in a future blog post. of 1897. Courtesy of Robert Stafford. "a No. 10 Western rock crusher, a 32 ton latest improved Austin riverside roller, an 18 horsepower high grade portable engine and boiler on wheels, an elevator 19 feet in length and a six-foot revolving, anti-friction steel spring screen dividing stone into three sizes." According to the Times, the Commissioners expected to receive the equipment and have it in operation before their July 5 meeting. Copies of the Minutes of the Cabarrus County Commissioners from 1868 to 1940 and the Concord Times from 1885 to 1929 are available at the Concord Library, Lore History Room. 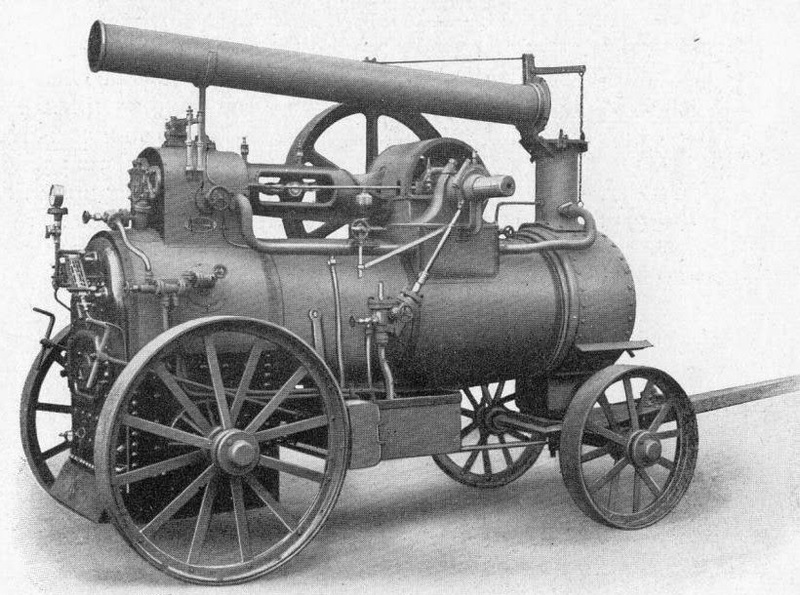 Commissioners purchased a steam powered "portable engine and boiler on wheels," similar to the above model. Courtesy of www.practicalmachinist.com .